*This Barcode Addin is only compatible with Office 2010 and earlier. This set up will allow the ability to add the IDAutomation VBA Code and Barcode Macros as an add-in for Excel so the IDAutomation Barcode Macro functions will automatically be available every time a spreadsheet is created. Most recent versions of Excel require a medium security setting to run macros. Open Excel and set the security level to medium by choosing Tools – Macro – Security. If a spreadsheet is used that is different from the sample IDAutomation provides, import the macro into the spreadsheet. Once imported, go to the File menu and select Save As. 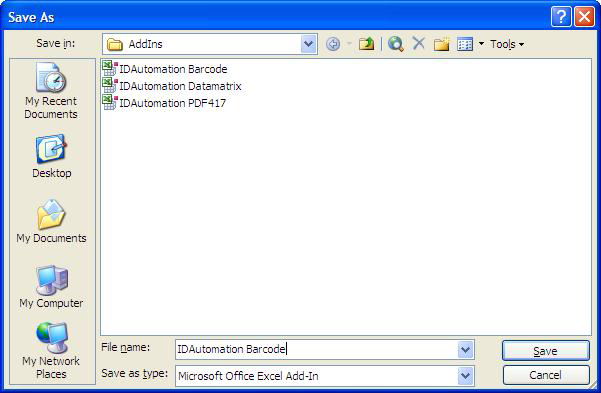 In the “Save as Type” drop-down list, choose “Microsoft Office Excel Add-In”; give the file a descriptive name such as IDAutomation Barcode and click Save. Close this workbook and open a new one. A list of the Add-Ins should appear. 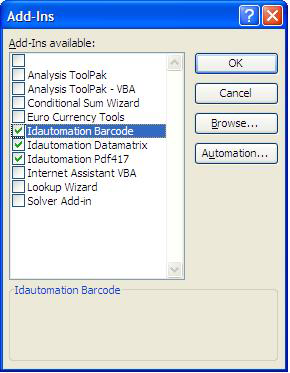 Check the box of the add-in created earlier, called IDAutomation Barcode in this example. For information about other methods of Excel barcode creation, please refer to the Excel Barcode FAQ & Tutorial.